Have you dared to sit on a cliff overlooking Yosemite Falls? Have you watched the sun set over Bryce Canyon as its conical shapes seemed to rise and fall? Have you hiked up the rocky river inside Zion’s narrow canyon walls? We did, and are anxious to return to do it again. Have Yellowstone elk in Mammoth Hot Springs, bison, and wolves ever caught your eye? Or a Navajo woman with hand crafted jewelry overlooking the Grand Staircase splendor where we found fossils and petroglyphs on a hike? Or 10,000-year-old Anasazi ruins near the Grand Canyon’s edge? Or chatted with chipmunks and Kaibab squirrels at 9,000 feet on Bright Angel Point Trail? But my most magical moment as an artist and mother was on the North Rim Lodge patio painting with our son. We were mesmerized by the changing light as canyon formations glowed pink, orange, and gold. Purple shadows in double backed folds couldn’t be found if we looked down. It was the most challenging watercolor I’ve ever created, but Danny painted without hesitation. His calm concentration was an inspiration and etched the experience into my soul. While visiting the Canyon’s South Rim with college friends some 20 years before, I took a job as a “Harvey girl” waitress so that I could stay on. Every 10 days, on my two days off, I leapt like a mountain goat down Kaibab Trail. I served hikers and muleteers at Ghost Ranch in exchange for meals and a rustic bunk. A cowboy taught me to shake out my boots so a scorpion wouldn’t sting my foot! I crossed Bright Angel Creek under cottonwood trees, and a pink sidewinder rattlesnake startled me. When rafts floated past on my 24th birthday, a friend from the U.S. Geological Survey suggested I offer to cook and clean for a free week of white river rafting. The Colorado River was thick with silt as we maneuvered through its perilous tumult. We survived Lava Rapids with our hearts in our throats for rafts had turned over just days before. We camped, cooked, ate, and slept along the river’s sandy banks. We purified muddy water to drink and swam in cascading Havasu Falls. Each day we traveled through canyon walls, and wound our way to the end at Lake Mead. A truck took us back to civilization; then, courtesy of a kind father and son, their helicopter returned me to the South Rim. Such adventures help shape our lives in some of the earth’s most majestic places. How many Americans have been touched and inspired by our national parks, and I wonder if our foreign guests are enriched, awed, and blessed by them, too? “We are impressed by the vastness of your parks like the Grand Canyon,” Colette continued. “It is so big, far wider and deeper than our deepest canyon in France, the Gorges de Verdon. We were surprised at how narrow the Colorado River appeared, just like the Rio Grande did. I remember, in 2004, being shocked to see a red signal on the Grand Canyon’s North Rim, the less touristy side, indicating that there was air contamination coming from Los Angeles on windy days. I couldn’t believe that pollution could travel so far and be in such a wide open and beautiful place. When we drove and walked in Yosemite Park it was completely different. I’d heard about Yosemite from my aunt and her husband who often drove there from their home in Beverly Hills and wrote us about their experience. My brother and I realized that it must have reminded them of the Alps in Baden-Würtemburg, Germany. When the Pascals stayed with us in Vermont, we visited the Marsh-Billings-Rockefeller National Historic Park. They enjoyed the mansion décor and nature exhibits, and were fascinated by the park’s historical significance in the areas of conservation, farming, and forestry. President Trump’s executive order to direct the Department of the Interior to review monument designation and rescind protection for millions of acres of land and water endangers Teddy Roosevelt’s legacy of conservation and many American treasures. In 1906, President Theodore Roosevelt enacted the Antiquities Act to protect archaeological sites in the West. He protected the Grand Canyon in 1908, and designated it a national park in 1919. Herbert Hoover declared Death Valley a national monument in 1933 and it became a national park in 1994. The Antiquities Act has allowed 16 presidents to designate and protect 157 national monuments for their immense natural beauty and cultural, historical, and scientific significance. Nearly half of those monuments have become national parks. In 2016, the National Park Service centennial year, the Grand Canyon received nearly 6 million visitors, Yosemite had over 5 million, and more than 330 million total to our national parks, an increase of nearly 8 percent over 2015, according to the LA Times. Our national parks are one of America’s greatest treasures. They must be protected for their beauty and greatness, and are irreplaceable if forever lost. Marguerite Jill Dye is a Vermont and Florida artist and writer who loves to travel the world and hike in Vermont and America’s national parks. 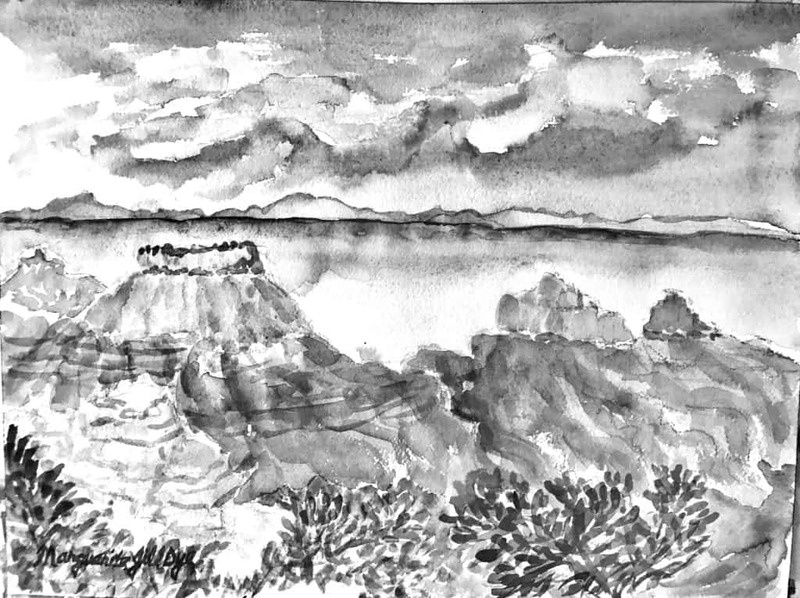 Grand Canyon Mist from the North Rim, painted as a watercolor en plein air.